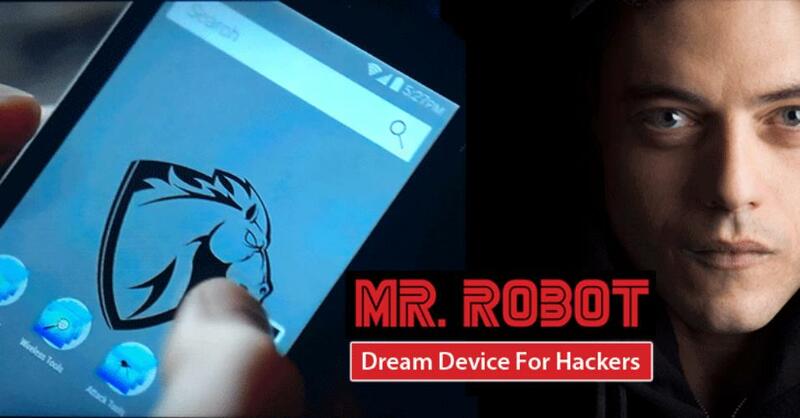 Security researchers discovered a new vulnerability in WPA3 Protocol named as “Dragonblood” allows hackers to steal the WiFi Password from WP3 enabled WiFi Network. This serious vulnerability in WPA3 protocol let cyber criminals crack the password and access the encrypted traffic to steal sensitive data transmitted such as credit card numbers, passwords, chat messages, emails. 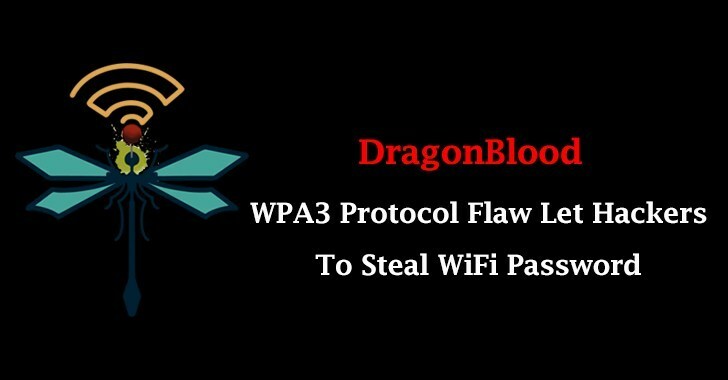 WPA3 protocol was recently announced by Wi-Fi Alliance and claims that it is impossible to crack the password of a network due to the powerful Dragonfly handshake but now its proven wrong due to this new Dragonblood vulnerability. Most of the WiFi network still using 14-year-old WP2 protocol which is actually vulnerable to Krack Attack Since then WPA3-Announced to Improve Security for personal and enterprise Wi-Fi networks. In this case, Researchers uncovered 2 different design flaw in WPA3 Protocol, and the both vulnerabilities can be abused by the attacker to steal the password in the targetted Wi-Fi network. First flaw is the Downgrade attack on WP3 is due to a transition mode that implemented in WPA3 by WiFi Alliance allows a network can simultaneously support both WPA2 and WPA3. 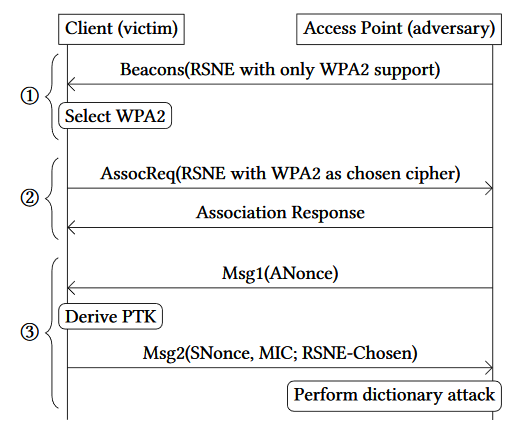 Since the WP3 enabled WiFi Network supports both WP2 and WPA3, by setting up a rogue Access point that only supports WPA2 let an attacker connect using WPA2’s 4-way handshake to perform offline Dictionary Attack. The second flaw, Side-channels leaks allows attackers to perform Cache-based side channel attack and Time-Based Side channel Attack due to the vulnerabilities in the Dragonfly handshake. Cache-Based Side-Channel Attack CVE-2019-9494. let attackers run unprivileged code on the victim machine and this attack allows to determine which branch was taken in the first iteration of the password generation algorithm of Dragonfly. Similarly, time-based side channel Attack CVE-2019-9494 abuse the password encoding algorithm of Dragonfly handshake to perform the same password partitioning attack, which is similar to an offline dictionary attack. and analyze these flaws both theoretically and practically." Dragonslayer: implements attacks against EAP-pwd (to be released shortly). Dragondrain: this tool can be used to test to which extend an Access Point is vulnerable to denial-of-service attacks against WPA3’s SAE handshake. Dragontime: this is an experimental tool to perform timing attacks against the SAE handshake if MODP group 22, 23, or 24 is used. Note that most WPA3 implementations by default do not enable these groups. Dragonforce: this is an experimental tool which takes the information recover from our timing or cache-based attacks, and performs a password partitioning attack. This is similar to a dictionary attack. Both Vulnerabilities are currently patched and released an update by WiFi Alliance, a non-profit organization that promotes Wi-Fi technology and certifies Wi-Fi products for conformity to certain standards of interoperability.